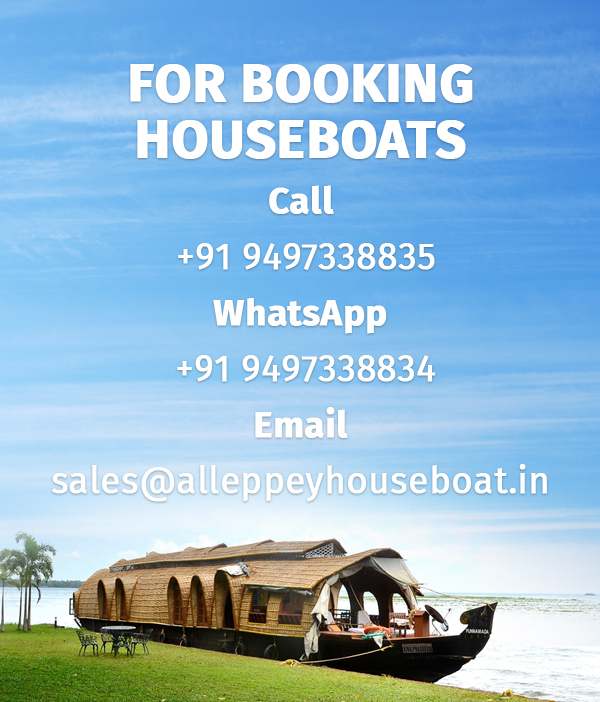 Alleppey Houseboat Booking Guide - Everything you need to know !!! What is so attractive about the backwaters of Kerala? The backwaters of Kerala are a dense network of rivers, canals and lakes that are interconnected and are more than 900 km in length. A number of villages and towns are situated on the banks of the backwaters. They are unique because the freshwater from the rivers and the seawater from the Arabian Sea meet here. In many areas, barriers have been built to prevent the seawater from mixing with the freshwater. This freshwater is then widely used for agricultural activities. Theses backwaters are home to a wide variety of aquatic animals including crabs and turtles. What is a Kerala houseboat and what are the facilities offered? The houseboats of Kerala are the modified versions of the boats that were used for the transportation of goods in the past. The houseboats vary greatly in their size from those having single bedrooms to those having around ten bedrooms! They have a wide range of facilities such as attached restrooms, geysers and some of them even have a WiFi connection. The houseboats are mainly divided into two categories: deluxe and premium. Premium houseboats offer more facilities than deluxe houseboats such as Jacuzzi, premium quality food, showers and many more! Which is the best season to hire a houseboat? Traditionally, houseboats can be hired all the year round. However, the months of December and January comprise the peak season. You may try and plan your trip between May and August or during the peak season so that you can avoid the monsoon showers and enjoy your trip to the maximum! Some people, however, prefer to enjoy monsoon rain while on their trip. Since the people who prefer so are less, they enjoy attractive discounts. But if you plan to hire a houseboat in Kerala between May and August, it is highly advisable to go an air-conditioned one as the heat is just too much to bear! Where can you hire a houseboat? Kerala has many beautiful backwater destinations of which the most beautiful are Alleppey and Kumarakom and this is the reason why a major lot of houseboats are hired from Alleppey or Kumarakom. Alleppey is also famously known as ‘Venice of the East’. A large number of houseboat operators are based in Alleppey. Alleppey is known for its lakes, lagoons, paddy fields etc. From Alleppey, you would be taken to the various backwater places such as Kumarakom and Kottayam. Most people board their boats in Alleppey and de-board in Kumarakom or vice-versa. You can choose your destinations based on your own preferences! Houseboats usually cover around 50-60 km in a day and this would be more than enough for you to enjoy the breathtaking view! Many luxury hotels and resorts even have their own houseboats. They usually provide sunset cruises or a trip overnight. Many hotels, especially those who don’t have their own houseboats, may arrange one for you! In this way, you can experience a houseboat cruise while living in a hotel. For how long should you hire a houseboat? It totally depends on you, how much time you want to spend on a houseboat. You can hire a houseboat for as short as a day to as long as a week! But the most preferred time range is two days. It may become monotonous and boring for any length of time exceeding this. 48 hours on the houseboat is definitely more than enough for you to refresh yourselves and enjoy the scenic beauty! How to pick the appropriate houseboat for your stay? The houseboats of Kerala are general made of environment-friendly materials. Most of them have thatched roofs usually made of bamboo. The houseboats have fully furnished bedrooms with private balconies and attached washrooms. The crew mostly comprises of a cook and two to four oarsmen. All of the houseboats have sufficient safety measures and the tourism department of the government of Kerala organizes periodic inspection of these boats so that your safety is not compromised! Go for the houseboat that has all these facilities. Deluxe Boats: These are the basic single bedroom boats which are just too ordinary for you. We advise you to not go for a deluxe boat as they lack many of the facilities that you may require during your stay such as air conditioners (only available at night), geysers etc. Premium Boats: These boats are much more convenient and comfortable for you in comparison to the standard boats. They have air conditioning facilities 24 hours a day along with a glass verandah. These are the most preferred houseboats as most people cannot bear the high cost of the luxury boats. Luxury Houseboats: These boats are far more luxurious than the two mentioned above. They have air conditioning facilities 24 hours a day and many more facilities such as a viewing deck, a television, a glass cabin and many more! The cost of these boats may be high but it is surely worth it! You may choose whatever you think would be the best for you and your family! What is the cost of hiring a houseboat? The costs of the houseboats vary greatly depending upon the size and quality of the boat and the facilities offered. It also depends on the time of the year and triples during the peak season. The houseboats are available for hiring at prices starting from Rs 5000 per night for a shared single bedroom standard houseboat and Rs 7000 for private houseboat to Rs 20,000 and above per night for a luxury houseboat. It costs around Rs 10,000 per night for a deluxe houseboat. Large houseboats with multiple bedrooms for large families are also available. The prices of such luxury boats begin at Rs 25000 per night. You may choose the houseboat that suits best to your budget! The cost mostly includes freshly prepared food, made by the cook and ample drinks. In case you want privacy, mention it beforehand that you need the whole houseboat to yourself as most of the houseboats have multiple bedrooms which are most likely to be occupied by other people. You should avoid travelling in the peak season as there is a 20-80% hike in prices due to the shortage of houseboats! Should you opt for a day cruise or an overnight stay? You have two options for choosing the time of your trip in the houseboat. It can either be a day cruise or an overnight stay in the Kerala houseboats. A day cruise begins earlier than an overnight cruise but the cruise time lasts till 5:00 pm in the evening. An overnight stay involves steering the boat to a spot in the middle of the Kerala backwaters so that you can experience sleeping in the middle of nowhere! A day cruise is more favorable in case you have to catch an early morning flight or you are travelling with a child or senior citizen who may have difficulty in sleeping in the houseboat at night. You should also avoid overnight stays in the houseboats during the monsoons as there is a high risk of mosquito bites! The origin point of both: day cruise or an overnight stay is either Alleppey or Kumarakom. Alleppey – Kumarakom: A number of resorts and hotels are located on the banks of the Vembanad Lake that is situated in this area. Kumarakom is well known for its bird sanctuary. The canals here are so wide and you need to cross the wide stretches of water in order to reach your destination! Alleppey- Kuttanad: This region is famous for its paddy fields. The canals here are extremely narrow but this region is an excellent spot if you want to witness village life. You might be interested to know how farming is done below sea level in this area! Alleppey- Thottappalley: This route has a number of tourist attractions such as the traditional house on the bank which is called Chavara Bhavan, the Buddha Temple and the Champakkulam Church etc. This is one of the most beautiful backwater cruises of Kerala. You can personalize your trip route and choose whatever route suits your purpose of visit! Hiring a houseboat for your honeymoon? In case you plan to enjoy your honeymoon in a Kerala houseboat, you can ask for special arrangements such as flower decoration, a candle light dinner, scented candles etc. to make your honeymoon worth remembering. You may also include the romantic destinations such as Marari Beach, Munnar etc in your itinerary. Should the houseboat be pre booked? We recommend that you pre-book the houseboats if you plan to visit Kerala during the peak season. Also, even though the houseboats can be booked on spot during the off season, the boats provided by the reputed operators get booked beforehand. There are tourist counters at Alleppey and Kumarakom where you may pre-book the houseboats. You can take a look at the various houseboats there, bargain with the operators and select the one that satisfies your preferences and budget! How to pick the perfect houseboat? Houseboats with a double deck: As the name suggests, these houseboats have double decks. You can enjoy the mesmerizing view from the upper deck here! They have the capacity to accommodate more people due to their size. There are usually two bedrooms with an attached restroom, a separate living area with a television and a music system for your amusement and a sundeck. The lower deck comprises of two large bedrooms of which each has the capacity to accommodate 2 adults and 3 children. It also has a dining area which usually has a television and a sit-out area. This boat can be easily hired by two groups at the same time. The two decks ensure that there is no invasion of your privacy! Houseboats with a sun deck: These houseboats don’t have an upper deck but a sun deck that allows you to admire the scenic beauty as the houseboat traverses the backwaters. There is usually a staircase in the welcome area that leads to the sundeck which is either open or glass covered. Houseboats without an upper deck: These houseboats are made from the different parts of a coconut tree. These boats resemble a house with two bedrooms, a kitchen and a sitting area in appearance. You can choose any of the three types of houseboats listed above and enjoy your trip as each one of them offers a different experience! What should be the menu of the houseboat? Food is a crucial part of any trip. While on the houseboat, you would be served with freshly prepared meals inside the houseboat. The cuisines on the houseboat include North Indian, South Indian and Continental but their specialty is the local Keralite cuisine. Refreshment drinks comprise of coconut water and a few other beverages. The local fish fry is definitely the star of the show. The cooks specialize in non-veg items. But you can personalize your menu according to what you like. After all, the cooks are at your service! It is recommended that you follow some precautions to ensure your own safety. Try and avoid a late check-in as you may miss a major part of the cruise. Do not strand your boat in completely isolated areas; anchor your boats where you feel safe. Try not to steer after 6 in the evening as the sky becomes foggy and it reduces visibility which may cause accidents. Have the crew seal the doors and windows shut in the evening to prevent the entry of mosquitoes. So, follow these guidelines with utter caution in order to make your trip worth remembering! Just remember that it is your safety and your pleasure that matters the most to us! PreviousPrevious post:Alleppey houseboat rates for one dayNextNext post:Why Alleppey is the No.1 Backwater Destination?